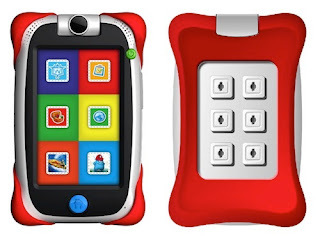 Fuhu, the maker of the Nabi and the Nabi 2 Tablets, is out with a new kids friendly tablet, named the NABI JUNIOR. and parents have the option of side-loading the Amazon Appstore for a larger software selection. 4GB/16GB internal storage, WiFi and Bluetooth. At the center of the Nabi Jr. is an adaptive learning system that aims to provide as much entertainment as it does education for its young users. from over 2,500 fundamental skills in reading, writing, and math to deliver personalized lesson plans for kids based on individual proficiency. The most interesting feature if the Nabi Junior is its price - $99 for the 4GB model or $129 for the 16GB. The Nabi Jr. will be available at retailers nationwide beginning in mid-December, right in time for the holidays. 0 Respones to "NABI JUNIOR Unveiled, Priced at $99"